Peg Brantley will be appearing at Local Editions Books & Coffee in Longmont on Saturday, September 26th. Please visit http://localeditionslongmont.com/home for more information. An explosive new thriller set amid the Israel-Palestine conflict, Chris Goff’s Dark Waters is a series debut that mirrors global headlines and will have readers frantically turning pages. Raisa Jordan, an agent for the U.S. Diplomatic Security Service, isn’t in Israel for more than a day before her predecessor is gunned down in a Tel Aviv square by a sniper. Assigned to investigate the assassination of one of her own, she must also protect Judge Ben Taylor and his teenage daughter. They may be the sniper’s next target and are most certainly being threatened by a desperate cadre of terrorists with their sights set on the Secretary of State’s upcoming visit. But is an attack on the Secretary of State all that they have planned or is that just the beginning? Copies can be pre-ordered now at Barnes & Noble, Amazon, and IndieBound. Chris Goff is an award-winning author of international thrillers and the Birdwatcher’s Mystery series. As Christine Goff she has written five novels in the bestselling Birdwatcher’s Mystery series and was nominated for two WILLA Literary Awards, a Colorado Author’s League Award, and published in the UK and Japan. In November of 2014, Astor + Blue Editions reissued her backlist and the sixth book in the series, A Parliament of Owls, is scheduled for release in 2016. 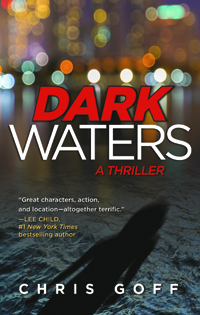 Dark Waters, the first title in her new international thriller series, is set in Israel and scheduled for release by Crooked Lane Books on September 15, 2015. A former journalist, Goff began her career writing non-fiction for several local newspapers in Summit County, Colorado, as well as articles for regional and national publication. She later edited rock and ice-climbing guides for Chockstone Press, worked in graphic production for “Living the Good News,” a division of The Morehouse Publishing Group, and taught writing workshops for the Colorado Free University, the University of Colorado (multiple campuses), and at writer’s conferences internationally. A long-standing member of multiple writing organizations, she has served on several local, regional and national boards, including Mystery Writers of America. Goff lives in Colorado. Visit her at Barnes & Noble. Peg Brantley will appear at the Local Author Book Fair held by the Poudre River Public Library District on Saturday, August 8 from 11 a.m. to 4 p.m. at the Old Town Library, 201 Peterson Street, Fort Collins. The event features numerous Colorado writers and illustrators; 20% of each sale will support the Friends of the Library. Peg will be there until 2 pm and says, “I’d love to meet some SinC friends who live in the area.” For more information, visit http://www.poudrelibraries.org. Chris Goff will be participating on the “Thrillers” panel moderated by Steve Brewer. For more information on this event, please visit the Rocky Mountain Chapter of Mystery Writers of America website. Chris will be speaking on a “Thriller” panel with Jeffery Deaver and presenting a one-hour workshop entitled “Elements of the Modern Crime Novel.” Every good crime novel be it a mystery, suspense or thriller has basic components that make it stand out. She will be sharing tips on crafting crime fiction that sells in today’s market. For more information or to register, please visit the RMFW website. A list of interviews and books events coinciding with the new release of Murder on the Horizon. SinC-Colorado members Rebecca Bates, Donnell Bell, Chris Goff, Becky Martinez, and M.L. Rowland will be appearing at this event featuring panels and roundtables of authors from New Mexico and Colorado. Special Guests: Authors Anne Hillerman, David Morrell, Steve Brewer, Joseph Badal, and Don Bullis. Co-sponsored by Sisters in Crime-Croak and Daggers chapter and Rocky Mountain Mystery Writers of America. Please visit their sites for more information. 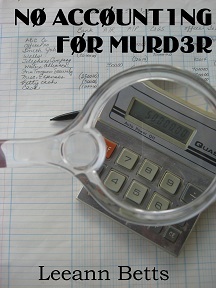 The first in the “By The Numbers” series, No Accounting for Murder, by Leeann Betts, releases August 15th, 2015 on Amazon, B&N, and Smashwords in digital format (available to pre-order on Amazon). Meet Carly Turnquist, a forensic accountant with a nose for a mystery, as she tries to solve the seemingly unconnected problems of a nudist colony in her quiet East Coast town, embezzled money, and a missing mayor. Events turn dangerous when she is threatened for not accepting an out-of-town job, then her brakes fail, and she is almost asphyxiated. Will Carly live long enough to reveal the killer or will she be forever silenced? Leeann Betts, who writes contemporary suspense, is the alter-ego for Donna Schlachter, who pens historical suspense. Both live in Denver, Colorado, spinning wild stories about dead bodies and asking way too many What If? Questions. You can check Leeann out at www.AllBettsAreOff.wordpress.com or http://www.LeeannBetts.com.